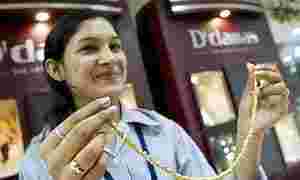 Investor-friendly: Demand for gold coins and futures is rising though jewellery sales are becoming more vulnerable to price fluctuations. Mumbai: Gold imports by India, the world’s largest consumer of the metal, are on course to hit a record above 800 tonnes this year, trade officials said. But they are unlikely to top 1,000 tonnes as forecast by analysts earlier. Rising incomes from a booming Indian economy and a stronger rupee have helped spur demand for gold, traditionally used in jewellery but now also favoured as an investment. But, a spurt in prices has made buyers wary, while other investment opportunities, such as a bullish stock market, lure money away. Imports by the end of the year may be “closer to 800-850 tonnes", said Rajan Venkatesh, director, India bullion, at Bank of Nova Scotia Bhd, a prominent seller of precious metals in India. India’s highest imports were 774 tonnes in 1998, a year after it eased import norms, World Gold Council (WGC) data showed. Imports in 2006 were 715 tonnes, while purchases between January and August this year were 664 tonnes, up 87% from a year earlier, it said. A firmer Indian rupee, which has climbed about 12% against the dollar since end-2006, helped soften gold for domestic consumers, prompting a bullish outlook for imports. “This year, I don’t see imports of 1,000 tonnes," said a senior dealer at Kotak Mahindra Bank Ltd, who forecast 850 tonnes if prices stay stable or soften from current levels. Indian buyers are sensitive to price swings. Imports in 2006 grew only 4% from 1997, while prices soared 128% in the same period, WGC data showed. This year, demand was buoyant when prices came off Rs9,000 per 10g in May and stayed below that mark until early September. Prices have since climbed, with overseas gold markets hitting 28-year highs this week. Gold futures were trading at Rs9,294 on Thursday. Madhusudan Daga, a former consultant of UK-based research firm GFMS, said artificial jewellery and the diversion of dowry to buy consumer durables also dented gold demand. “Take a look around Zaveri Bazaar," Daga said, referring to the bullion street in Mumbai. “Many of the jewellers have converted to artificial jewellery shops and they do a good business." Still, the lure of gold as an investment is picking up with demand for coins, exchange-traded funds and gold futures rising. “There is an increased awareness in investment and there are more avenues available," said Nayan Pansare, an analyst who has worked with several jewellery companies. “There is a perception that gold could cross $1,000 (Rs39,500) an ounce overseas," he said. In 2006, demand for gold as investment rose 38% to 186 tonnes, while jewellery showed a decline of 14%, WGC data showed.